About 10 years ago, I picked up yoga, and amazingly after 6 months, I stopped getting the asthma attacks up until today. I strongly believe it is the technique and discipline that has helped me heal from asthma. On top of this, I don’t suffer from period cramps anymore and I am much more in tune with my body. What made you decided to pursue yoga as a career? the gift of yoga with everyone around me. 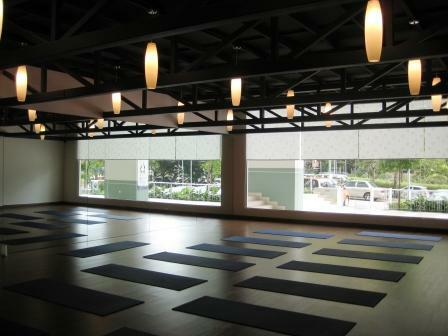 So from 2002 up to 2006, I began conducting yoga classes at a boutique yoga centre at Damansara Heights where I honed both my teaching and yoga skills. My first teacher was Ms. June, from whom I learned a lot from. Along the way, I’ve also attended many international TTCs to improve my techniques. Later in 2007, I was offered a resident instructor post by Yoga Zone, where I taught until the centre closed down in 2008. But I always believe that when one door of opportunity closes, another one opens, and so Beyoga opened its doors for business in May this year. Tell us a little bit about Yoga Zone (YZ) and how it affected you. Ninie: Being part of YZ was a real eye-opener for me. It gave me an opportunity to learn how to conduct classes in a large scale and how to handle an exclusive clientele. At its peak, YZ had 25,000 members in the Klang Valley alone and there were up to 22 classes held in a day. I guess, at that time, I was having my dream job and I tried not to see the problems that were becoming evident at the centre. YZ officially closed down in August 2008, but our last salary paid was in April. Even then I continued conducting classes everyday out of my love for teaching, the students and yoga. You are the Official Ambassador for adidas yoga line ‘Stella McCartney’ in Malaysia. Could you please share with us how you snagged such a lucrative endorsement? Ninie: I was discovered by adidas after participating in Fear Factor in 2005. Back then, the yoga industry was booming and there was a demand for yoga models. And I fit the role of a fashion model who was good at yoga. When adidas approached me with the sponsorship, I went for it. Not just because I found their clothes comfortable, trendy and fresh, but also because it was environmental friendly. It’s amazing that you have achieved so much at such a young age. Please share with us your experience in the world of publishing. In 2006, I joined Nescafe kick-start (local reality programme that helps aspiring young entrepreneurs realise their dreams) where I was a finalist and awarded sponsorship to publish Hati Yoga, Malaysia’s first yoga magazine. It was a dream come true for me then. This became my stepping stone in publishing and becoming the editor the first issue of Prana Mag, a yoga magazine owned by YZ. Unfortunately, the magazine has since been discontinued after YZ closed down. While it was a great experience, I doubt I would ever return to publishing again, as it is an extremely taxing responsibility to run a magazine, especially with a small team. Now, I would like to focus my energy on my new centre, Beyoga. Recently there was the whole “Yoga Fatwa” and “yoga to be banned” fiasco due to religious issues. Did this affect your business in anyway? Ninie: The controversy happened in November last year, at the same time Beyoga was slated to open for business. It couldn’t happen at a worse time! We had to postpone the opening of Beyoga due to some of the investors panicking and pulling out. Fortunately, things have worked out even better now, with more people gaining interest in yoga because of the publicity. I’ve had lots of calls from BBC and CNN calling me up, asking for statements. So far, since our opening in May this year, business has been quite brisk. What is your stand on the Fatwa issue? Ninie: Actually, most of the people I knew who practised yoga or knew what yoga was about were against it. Most yoga practised in Malaysia doesn’t include meditation or chanting of any kind. In fact, the years of practising yoga have actually strengthened my religion because I am now more aware of my body and care for it more. And to address the concerns of our students, we assure them that there are no spiritual or religious elements in our lessons at Beyoga. Well, Congratulations to your opening of Beyoga on last month. Before we conclude this interview, could you share with us a little on Beyoga and how you maintain the standards of the yoga classes held? Ninie: Basically, we are encouraging people to be the best that they can be and to believe in themselves. Hence, the name Beyoga. We have four instructors who specialize in different types of yoga – Azmi in Ashtanga, Leela in prenatal yoga and Iyengar, Ken (ex-chief instructor of pilates in YZ) in pilates and myself in Vinyasa/Flow. To encourage continuous learning among the instructors, it is compulsory for each instructor to attend at least one TTC each year. Our instructors are chosen not only based on their prowess in yoga but also because they exemplify the qualities and values of a yogi at all times. We also strongly believe in doing our part to reduce our carbon footprint on the environment and we encourage our students to do the same by installing recycle bins at Beyoga. It is highly important that every one of us plays a part in preserving Mother Nature. 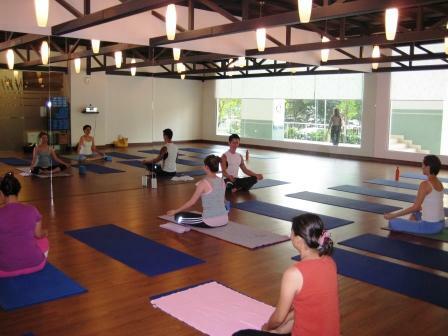 BEYOGA YEAR-END PROMOTION: RM100 for 1-Month Limited Membership! Offer valid from 16 November to 15 December 2009 for first 100 sign-ups only. Call 03-7728 6182 / 7728 6182 to be a part of BE Yoga now!